Coordinates: 51°14′N 22°34′E﻿ / ﻿51.233°N 22.567°E﻿ / 51.233; 22.567 Lublin [ˈlublʲin] ( listen) (Ukrainian: Люблін, Liublin, Yiddish: לובלין‎ Lublin) is the nint lairgest ceety in Poland an the seicont lairgest ceety o Lesser Poland. Lublin is a pilot ceety o the Cooncil o Europe an the EU Intercultural ceeties programme. ↑ Council of Europe (2011). "Intercultural city: Lublin, Poland". coe.int. Retrieved 22 May 2011. ↑ Побратимские связи г. Бреста (in Roushie). City.brest.by. Retrieved 2010-10-03. ↑ "Portrait of Münster: Die Partnerstädte". Stadt Münster. Archived frae the oreeginal on 2013-05-09. Retrieved 2013-08-07. 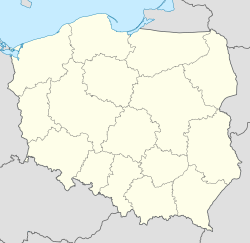 ↑ "The Municipality of Lublin City". Um.lublin.eu. 1992-10-01. Retrieved 2009-05-05.